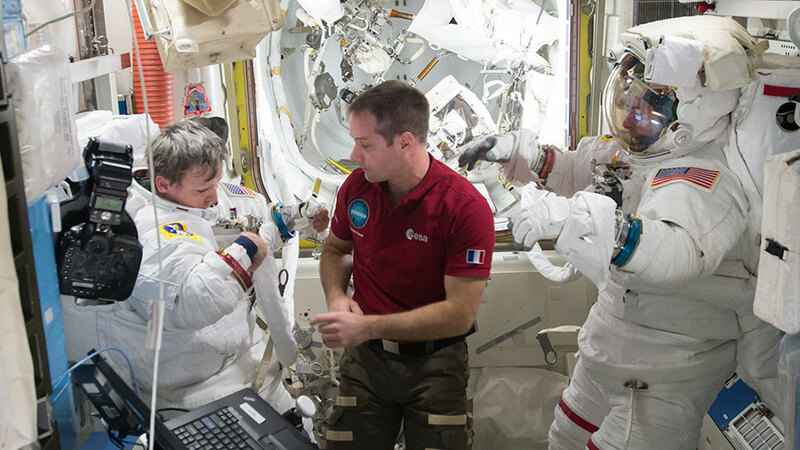 Astronaut Thomas Pesquet (center) assists spacewalkers Peggy Whitson (left) and Shane Kimbrough in the U.S. Quest airlock on Jan. 6, 2017. 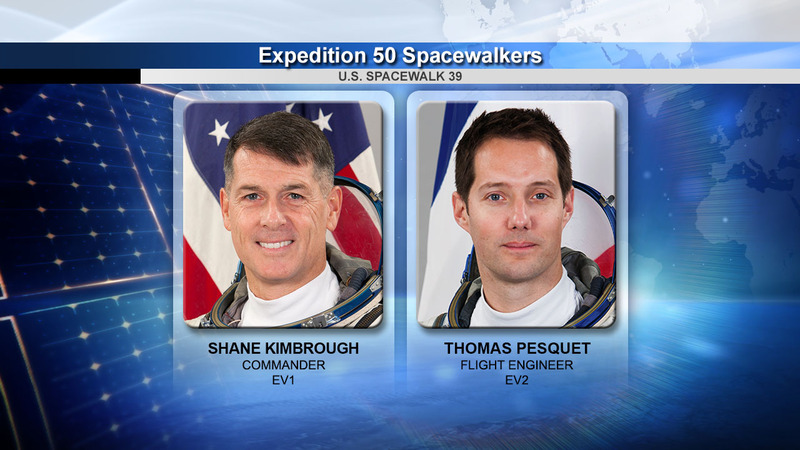 Expedition 50 astronauts Shane Kimbrough and Thomas Pesquet are ready for their mission’s second spacewalk that starts Friday at 7 a.m. EST. The duo will wrap up power maintenance work to connect new lithium-ion batteries and install adapter plates. Kimbrough and NASA astronaut Peggy Whitson started that work last Friday during a six-hour, 32-minute spacewalk. 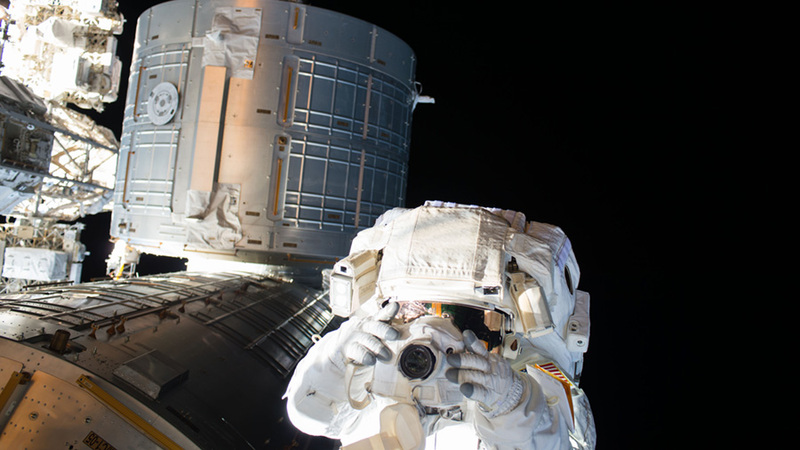 Both spacewalks complement the ongoing robotics work that started at the end of December. 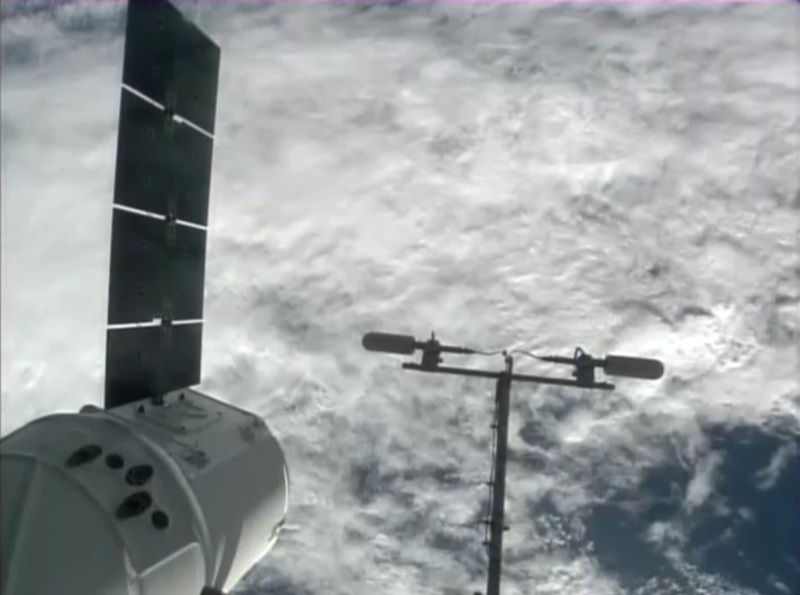 Ground controllers have been remotely-operating the Canadarm2 robotic arm and Dextre robotic hand to remove and stow the old nickel-hydrogen batteries and the install the new batteries. The three cosmonauts have been staying focused on their set of Russian space research and lab maintenance. 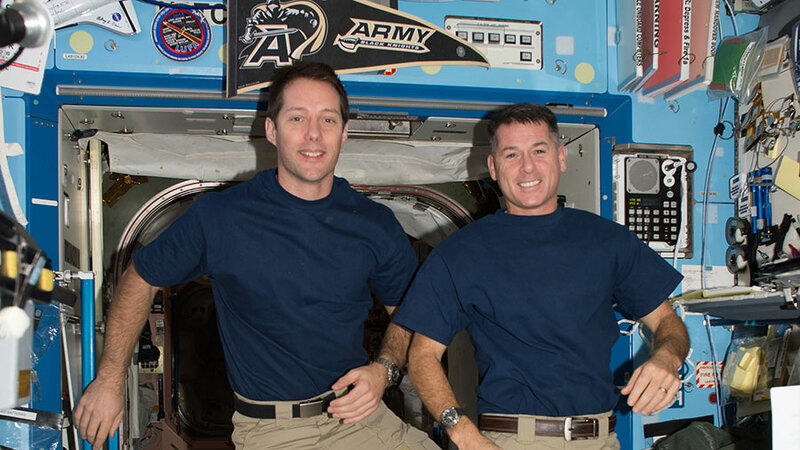 Station veterans Andrey Borisenko and Oleg Novitskiy collected blood samples for a pair human research studies looking at bone loss and stress responses caused by living in space. First-time station resident Sergy Ryzhikov explored chemical reactions caused by jet engine exhaust in the Earth’s upper atmosphere. The Soyuz MS-02 launched from the Baikonur Cosmodrome in Kazakhstan to the International Space Station at 4:05 a.m. EDT Wednesday, Oct. 19 (2:05 p.m. Baikonur time). 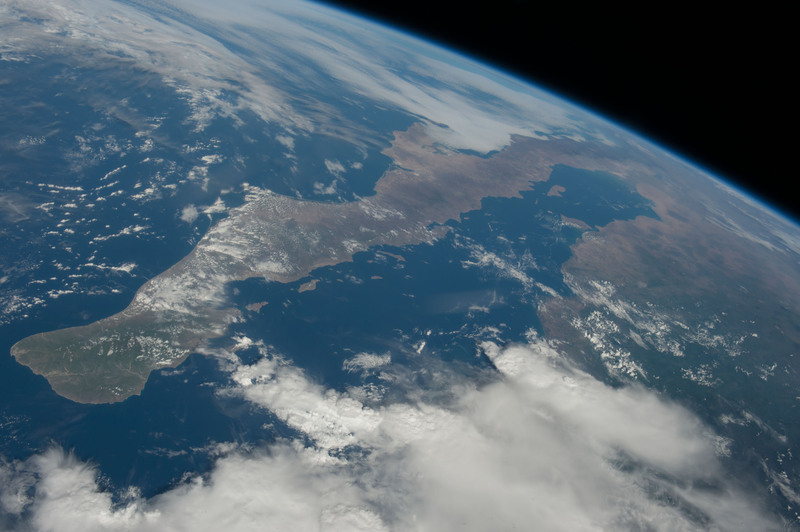 At the time of launch, the space station was flying 252 statute miles over the south Atlantic, east of Brazil. 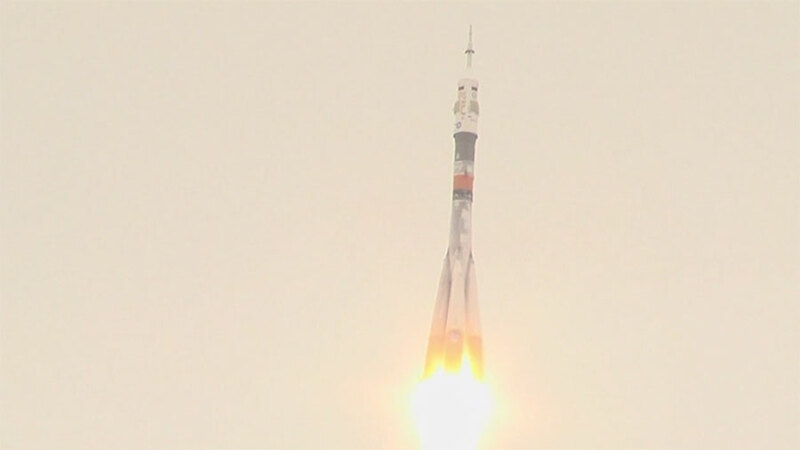 NASA astronaut Shane Kimbrough and cosmonauts Sergey Ryzhikov and Andrey Borisenko of the Russian space agency Roscosmos are now safely in orbit. Astronaut Kate Rubins is seen taking taking photographs with the Japanese Kibo lab module behind her during a spacewalk on Aug. 19. Expedition 48 Commander Jeff Williams and Flight Engineer Kate Rubins of NASA will begin a spacewalk outside of the International Space Station at about 8:10 a.m. EDT Thursday. NASA TV coverage will begin at 6:30 a.m.
Williams and Rubins will retract a thermal radiator that is part of the station’s cooling system. The radiator is a backup that had been deployed previously as part of an effort to fix an ammonia coolant leak. 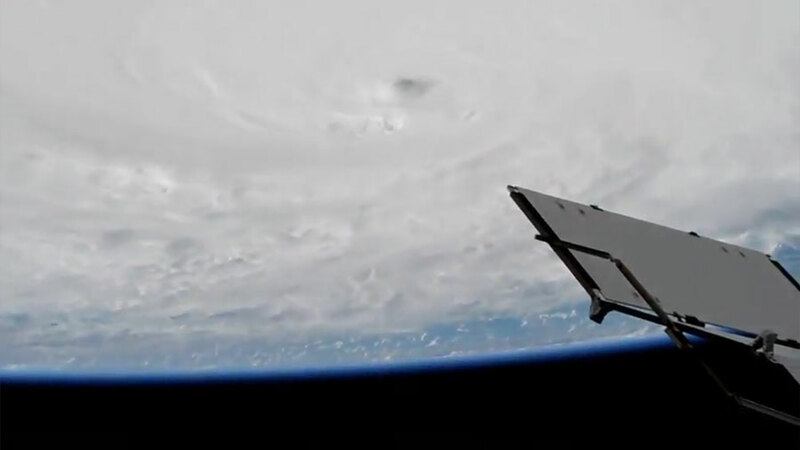 They’ll also tighten struts on a solar array joint, and install the first of several enhanced high-definition television cameras that will be used to monitor activities outside the station, including the comings and goings of visiting cargo and crew vehicles. Expedition 48 Commander Jeff Williams and Flight Engineer Kate Rubins concluded their spacewalk at 2:02 EDT. During the five-hour and 58-minute spacewalk, the two NASA astronauts successfully installed the first of two international docking adapters (IDAs). 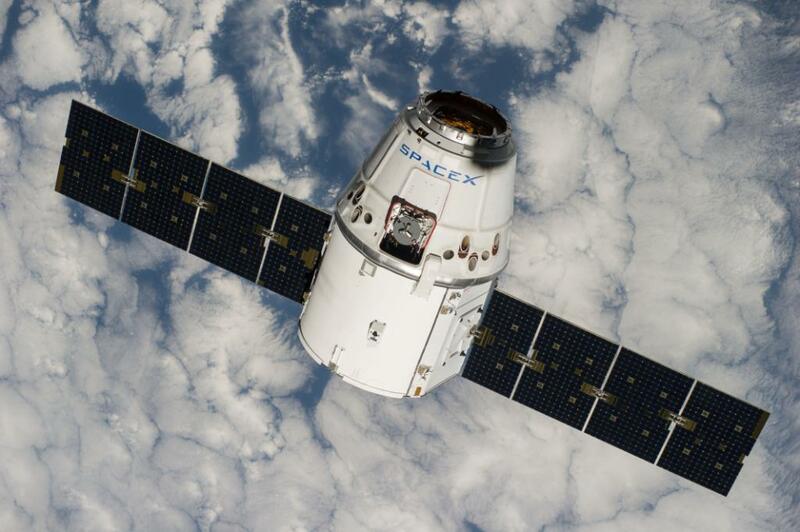 The IDAs will be used for the future arrivals of Boeing and SpaceX commercial crew spacecraft in development under NASA’s Commercial Crew Program. Commercial crew flights from Florida’s Space Coast to the International Space Station will restore America’s human launch capability and increase the time U.S. crews can dedicate to scientific research, which is helping prepare astronauts for deep space missions, including the journey to Mars. Space station crew members have conducted 194 spacewalks in support of assembly and maintenance of the orbiting laboratory. 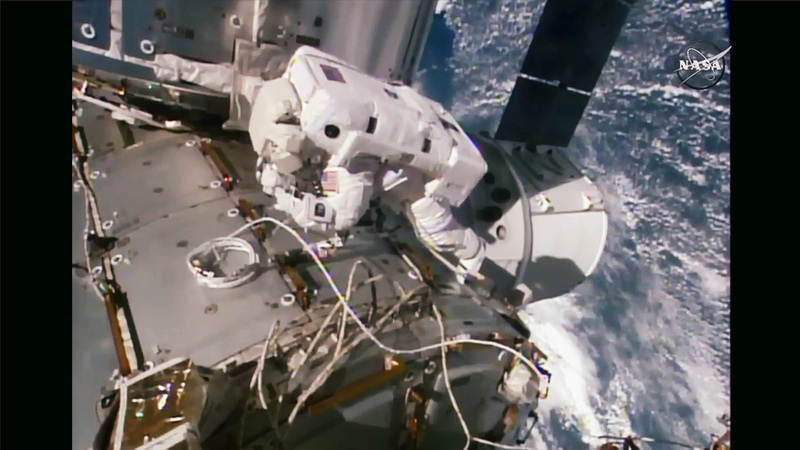 Spacewalkers have now spent a total of 1,210 hours and 46 minutes working outside the station.